Authors of books for young readers find so many ways to incorporate educational, things-you-need-to-know pieces of information into their writings. The author of today's poetry title has combined poetry, riddles, and nonfiction text in a unique and amusing way to explore the parts of the body. I was truly impressed with the creativity that was tapped to create this very special book. I am lucky to have to some wonderful friends who are there for me in good times and bad, who make me laugh, and who understand where I am coming from. I miss them when I don't see them, and feel rich after I have spent time with them. Today's picture book is about a friendship that is similarly enriching and wonderful. As the pages turn, two little pigs who are very different, but who are also best friends, come to learn something about the relationship that they share. 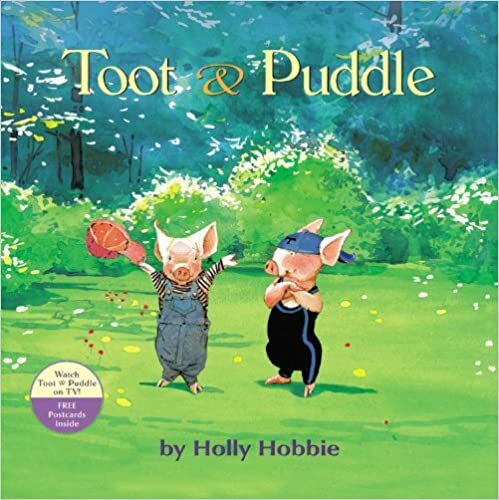 Toot and Puddle are a pair of pigs who live together, and they are the best of friends. One would think that they would have to be alike to be able to share a home, and yet they are actually very different. Toot loves to go off on adventures to all sorts of exotic places, while his friend prefers to stay home in comfy and homey Woodcock Pocket. One day Toot decides to go on a trip around the world. While he is gone, Puddle has a wonderful time at home doing all his favorite things. At the same time he gets to share in Toot's adventures by reading the postcards that Toot sends him from Egypt, Africa, the Solomon Islands, India, and many other places. However, even though he is having a good time at home, Puddle begins to miss his friend. He thinks about Toot as he goes about his daily activities. What he doesn't know is that Toot is having similar feelings. In this book the author has created a tale with unforgettable characters, illustrations to pore over, and a simple yet powerful text that is a tribute to friendships of all kinds. Sometimes we think that the perfect expressions of love or affection are the ones that are grand and extravagant. It turns out that often the best way to show someone that you care for them is by doing something for them that is simple, and yet powerful. In this picture book you will meet a bear who finds out that someone cares for him very much, someone who is shy, and kind, and thoughtful; someone who does little things for the bear that say an awful lot. One morning, as per usual, a bear crawls out of his cave, he rubs his eyes, stretches, feels the morning sun touch his fur, and then looks around for his breakfast. On this particular morning he discovers that someone has left an orange “long and pointy” thing on a rock. The bear has never encountered such a thing before, and when he sniffs it he decides that is smells “nice,” and so he nibbles it. The thing turns out to taste very good indeed. That day the bear discovers a bee nest in a tree, which he then proceeds to raid. The bear happily feasts off the honey comb and the honey. He could eat the whole lot, but he decides that he will save some for “the nice friend” who gave him all the orange treats. The bear leaves the honeycomb on the flat rock and he tries to stay awake to see who his new friend is, watching from his cave. Unfortunately, the bear is not very good at staying up, and he falls asleep. In the morning his friend has left him a little gift. A pretty flower is lying on the rock where the honeycomb was. Once again the bear wonders and wonders who the mystery person could be. This sweet story explores how a special friendship is built. With each gift, each act of kindness, the connection between the bear and his secret friend gets closer. Children will be delighted when they see how the story turns out, and when they discover what the bear, and his new friend, feel for each other. I didn't really know anything about this book before I read it, though I knew from past experience than anything Sharon Creech writes is going to be marvelous. This book is indeed marvelous, on so many levels. It explores the discoveries that a young girl makes as the world around her shifts and changes and I, at least, grew very fond of her very quickly. Her voice is true and strong and it is delightful to see how she matures as the story unfolds. This extraordinary book explores the way a twelve-year-old girl learns about the people in her world, and we see her trying to negotiate the trials that life throws her way. In the process, she starts to figure out what she wants and who she is, and she discovers that most people, and most challenges, are a lot more complicated than they at first seem. In 2014, a wonderful wordless picture book called Flora and the Flamingo won a Caldecott Honor. It is a delightful book that has charmed people all over the world with its wonderful artwork and its clever story. Since then Flora has gone on to meet a penguin, and now she is back strutting her stuff with a pair of peacocks. Flora has faced challenges before when she befriended the flamingo and the penguin, but these two peacocks present her with problems that are both new and difficult. Flora loves to dance, and somehow she tends to attract very lovely, very gifted characters who end up dancing with her, all of whom are birds. So far she has danced with an elegant flamingo and a charming penguin. This time Flora comes across a pair of peacocks. Wearing a pretty teal, blue, and green outfit, and with a yellow fan in her hand, she bows to the two peacocks. One immediately starts to approach her, and it is clearly rather interested in sharing a dance with the little girl. The other peacock, with its beak in the air, and later with its face completely hidden, makes it clear that it is not interested in joining in at all. Flora tries to reach out to the uppity, aloof peacock and she even starts to make friends with it, but then the first peacock takes umbrage and the next thing you know a very unfortunate situation is created. Three can be an uncomfortable number when it comes to making friends. Flora and the peacocks certainly discover that there is no knowing what might happen when jealousy and an unwillingness to share surfaces. Children will appreciate why things go awry, and they will be delighted when they see how Flora and the peacocks resolve their problem. This wordless book, with its flaps that open and lift ,and its pages that unfold, is a delight to the eye and the heart. Picture Book Monday with a review of Why? When I was five years old, a civil war broke out in the country that I was living in. Suddenly, and for reasons that I did not understand, people who had lived side-by-side were now killing each other. It was village against village, and neighborhood against neighborhood. To say that my experiences had a profound effect on me is an understatement. To this day I loath violence and hate-filled words. Today's picture book shows, to great effect, how conflicts can grow out of petty disagreements. It is a book that children and adults alike can connect with. One day a frog is sitting in a meadow and it picks a beautiful flower. Having the flower makes the frog very happy, but someone else is not happy at all. 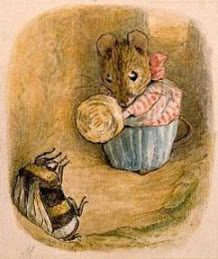 Mouse wants the flower that Frog has picked, and so Mouse forcibly takes the flower from Frog. Mouse does not get to enjoy ownership of the flower for long because soon Frog’s friends arrive on the scene and they chase off Mouse. The frogs celebrate their “victory” by gathering up all the flowers in the meadow and they dance around with joy. Their conquest is short-lived because soon Mouse returns with his friends. They roll up in an armed boot and chase the Frogs across a bridge, firing on them. The mice think that they have won and that the frogs have been routed, but their victory is also short-lived because the frogs have a plan in place to give the mice a taste of their own medicine. Children often ask grownups why wars start, and all too often the answer they get is long-winded and complicated. In this picture book the author shows readers of all ages that often the reason why people go to war is very simple, and very foolish. One act of violence begets a violent response, and the conflict escalates. Eventually both sides look across a scene of desolation and unspeakable loss and they cannot, for the life of them, understand how things got so bad. There is a message in this tale, a powerful message, that readers of all ages will appreciate and hopefully carry with them. They will see that responding to a problem with violence is never the answer.